by Robert D. Schamberger, Ferdinand J. Shore, Harvey P. Sleeper, Jr.
"Brookhaven National Laboratory, Upton, New York." "Date Declassified: November 21, 1955."--P. 2 of cover. similar content and title by the same authors. may be of more use to someone than none at all. in which the data are presented. The figures also contain background data. mitted flux is quite large. figure 2 to indicate the position of the top of the slot. able distance from the slot to be quite independent of the presence of the slot. has been expended to correct this situation. been necessary to estimate the background. these expectations are realized, they are not inconsistent with it. one-half inch. The data are net incc.nsisternt with an L-' dependence. 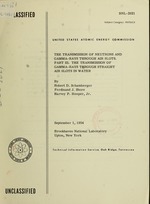 A description of the apparatus is given in Part I of this series. appear inpthe Minutes of the May, 195L Shielding Information Meeting. Go, w qm 1d y 7240. / Z~~~~ --I -jI I- -I Ii .. I ~ ~ ~ ~ ~ ~ I--I-- -- -- -- ----Z II I . __ ___, __, -r -t -f- ... .. .
"-:- '-I:- .- I ---. -- _-__ __- . - i .-- -"-II.... -- . __r _._I __ _. m ._ L .
_" _-62 -. -I _-_- _: 2 .--,-- -- ..... ..
4- -'4 ..4_ -- . --. .. q +_ -f ! - T --- -. .. .
_-_:~ ~ ~ -- c-..- .. .
2 : fi._._ -- . ,.~~ .. .. ---_: ..